On November 26, 1945, future actor Daniel Davis was born in Gurdon. As a child, his family moved to Little Rock where his parents ran a movie theatre. As a child, he appeared on “Betty’s Little Rascals” local TV show with Betty Fowler. While a student at Hall High, Davis had the lead as Horace Vandergelder in The Matchmaker (which would soon be musicalized on Broadway in Hello, Dolly! ), appeared in Judgment at Nuremburg, sang in the Hallmarks (concert choir), and was a Harlequin Player (drama club). He was also on the staff of the Warrior (yearbook), War Whoop (newspaper), and Inkwell (literary magazine). His fellow members of the class of 1963 voted him the Wittiest boy in the class. After graduating from Hall, Davis remained in Little Rock and enrolled in the new Arkansas Arts Center school of Art and Drama, a degree granting program. While there, he appeared in numerous plays. One of them was The Persecution and Assassination of Jean-Paul Marat as Performed by the Inmates of the Asylum of Charenton under the Direction of the Marquis de Sade. National theatre critic Henry Hewes of the Saturday Review came to Little Rock to review the production, which was presented a year after the play had won a Tony for Best Play. Hewes actually liked the Little Rock production better. After completing studies at the Arts Center, Davis worked with the Oregon Shakespeare Festival, American National Theatre Academy, Stratford Festival, and American Conservatory Theatre. He also started appearing in television, including a stint in the soap “Texas” and guest starring in many TV series. In 1993, he started a six year, 145 episode run as Niles the butler in “The Nanny.” His British accent on the show caused many in the public to think he was from England instead of Arkansas. Davis has continued to act frequently on stage. In 1969, he made his Broadway debut as the Dauphin in Henry V followed by an appearance in Othello. He was a replacement as Salieri in the original production of Amadeus. In 2003, he received an Obie Award for his appearance in Alan Bennett’s Talking Heads. Three years earlier he was nominated for a Tony for his appearance in Wrong Mountain. Other recent Broadway appearances include The Invention of Love, The Frogs, La Cage aux Folles and Noises Off. 52 years ago tonight, on November 15, 1966, Carol Channing opened a six day stint in HELLO, DOLLY! at Robinson Auditorium. She would play 8 sold out shows over those six days. 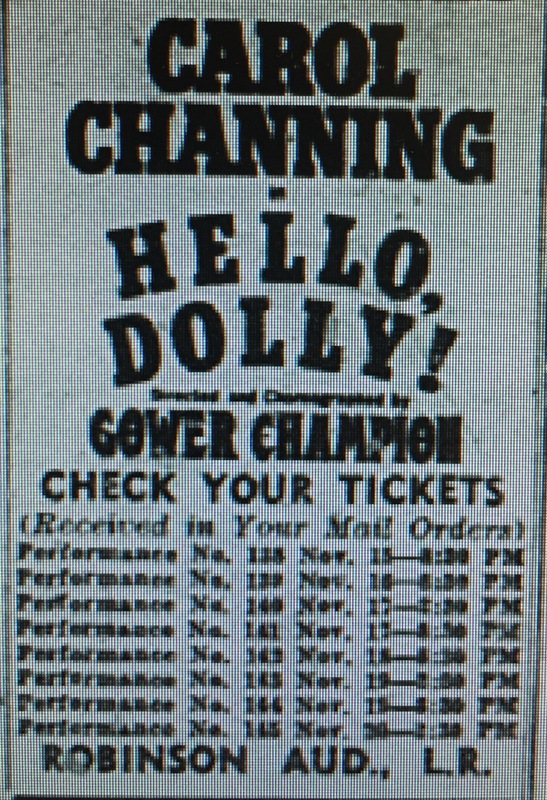 Channing, who had won the 1964 Tony Award for Best Actress in a Musical for her role in this show, had recently returned to the national tour. She had just wrapped filming THOROUGHLY MODERN MILLIE (for which she would receive an Oscar nomination). She had specifically requested that Little Rock be added to the tour. Her breakout role was in 1949’s GENTLEMEN PREFER BLONDS. In that show she introduced the song “Little Girl from Little Rock.” Since it had helped make her a star, she had long felt an affinity for the Arkansas capital. Therefore when she rejoined the tour, she required that LR be one of her stops before she left the tour. While in Little Rock, Channing was entertained at the Arkansas Governor’s Mansion and feted at parties. She was made an honorary citizen of Little Rock, as well. On March 31, 1943, Alfred Drake sauntered on the stage of Broadway’s St. James Theatre and sang “Oh, what a beautiful mornin'” to launch OKLAHOMA! into not only theatrical history but popular culture as well. But 75 years later (and 25 years after it was commemorated by the US Postal Service with its own stamp), Oklahoma! is still doing fine. Countless new generations sing the songs and say the lines. Two upcoming cultural events in Little Rock are a testament to the genius that helped create Oklahoma! In May, Ballet Arkansas will present a dance piece which was the final dance created by Agnes de Mille. Before choreographing Oklahoma!, Miss de Mille was already making her mark in the world of ballet. She alternated between the two for decades. At the 1993 Tony Awards, Miss de Mille accepted a special Tony upon the show’s 50th anniversary milestone. The second connection to Oklahoma! will take place in February 2019. The Arkansas Symphony Orchestra is bringing Oscar “Andy” Hammerstein III, grandson of the beloved librettist and lyricist Oscar Hammerstein II, to host a celebration of some of America’s most cherished music from the stage. After gaining the notice of New York critics and audiences in the musical revue, Lend an Ear, Channing achieved Broadway stardom playing fictional Little Rock native Lorelei Lee (the creation of Anita Loos) in Gentlemen Prefer Blondes. In this show, which opened in December 1949, she introduced the Leo Robin-Jule Styne songs “Little Girl from Little Rock” and “Diamonds Are a Girl’s Best Friend.” In 1964, she won the Actress in a Musical Tony for her second signature role playing the title character in Hello, Dolly! Channing also earned a special Tony in 1968 for Dolly when it became the longest-running Broadway musical. 50 years ago tonight, on November 15, 1966, Carol Channing opened a six day stint in HELLO, DOLLY! at Robinson Auditorium. She would play 8 sold out shows over those six days. Karen Q. Clark has played a sympathetic nun on film and an exceedingly unsympathetic nun on stage. In between she has been a singing nun (in The Sound of Music). Outside of the habit, she has appeared in New York, many regional theatres, and most (if not all) Little Rock stages. A native of Wisconsin, she came to Little Rock with her husband (and fellow thespian) Jay Clark. During the day, she is Lower School choral and drama teacher at Episcopal Collegiate School. In addition to being a fixture in the Little Rock theatre scene, she also has numerous credits in many Arkansas-made films. Favorite stage roles include: Mrs. Banks, Mary Poppins (Arkansas Rep); Betty in The It Girl (IRNE nomination, Worcester Foothills); Princess Rhyme in the world premiere of The Phantom Tollbooth and Rachel in Inherit the Wind (Wheelock Family Theatre); Irene in Hello Dolly! (Jekyll Island); Maria in The Sound of Music; and Narrator in Joseph and the Amazing Technicolor Dreamcoat (Arkansas Shakespeare Theatre). Another favorite role is being Quin’s mom.